It is common knowledge that humans perform optimally in a relaxed state no matter what the endeavor: competing in a 100-meter sprint, a hockey game, a golf match, socializing or writing an exam. Stress makes for less happy, less healthy and less productive people. Stress cannot and should not be avoided as it propels the human race forward by providing urgency. However, it is critical to deal with stress appropriately when it occurs. Three recent experiences brought this truism to the forefront for me. The first was an encounter a few weeks back with a fellow who was promoting a new mouth guard. After putting the mouth guard into one’s mouth strength, balance and flexibility improved dramatically and instantaneously. The explanation, which was confirmed to me by one of the pre-eminent nervous system experts in the world, is that it relaxes the jaw. The mouthpiece does not allow the muscles in the jaw to tense up. When the jaw tenses it inhibits the nervous system. When the jaw is relaxed the nervous system can perform freely without blockages. Ever wonder why Michael Jordan had his tongue out while driving the hoop? Physiologically, it did what the new mouth guard does; it prevented his jaw from tensing up and blocking the nervous system. Instinctively, one of the best athletes that ever lived felt better with his tongue out as it helped keep him relax during competition. The second encounter that drove home how essential it is to relax, is the boxing lessons I’ve been taking recently. I hooked up with Jorge, an ex pro boxer from Spain that works with a lot of pro hockey players. To survive and excel in a fight one must be relaxed. Instinctively, most of us get all tensed up when fighting. When tense, one’s breathing is encumbered which results in getting fatigued quicker. It also hinders one’s power when punching and the ability to read and react to the opponent. As I became more aware of the times when I tensed up, I was able to relax the body and breathe. The result was less fatigue, better blocking and punching combinations and more power in my strikes. I then went surfing recently and I applied these lessons in the water. Because of my boxing and mouth guard-wearing experiences I was more aware of when my body tensed up. Like goaltending, surfing is very stressful. The current, waves, the reef below and other surfers can combine to make one feel like he is fighting for his life, which can literally be the case if one is not extremely alert and careful. Whenever I felt myself tensing up, I relaxed my jaw, shoulders, and neck and made sure I was breathing deep and calmly. I caught more waves than ever before even though I hadn’t surfed in eight months. I’ll give an example of the difference being relaxed makes. After riding a wave one must paddle back out to where they are breaking. On the way out more sets usually come in and one must paddle through the waves. At times it can be scary. Sometimes one gets caught with a huge set coming at him. If you are in the wrong spot when the wave breaks it can crash right on top of you and work you like a washing machine tosses clothes. Not much fun. (The ocean seems to think I’m a pair of dirty jeans.). As you see the wave coming towards you, you must paddle fast enough so that you can duck under the wave before it crashes. In the past I’d clench my jaw, tighten up my back and stroke like mad to get past the wave. More often than not I wouldn’t make it. I’d get hammered. Eventually the white water subsides and I would scramble to the top gulping for air, brush off my wounds and try again. Of course I’d be exhausted from the fight to stay alive, which would make it even more difficult to paddle out again past the incoming sets; hence, the dirty jeans treatment I so often succumbed to. This time, however, I was way more proficient at paddling out. Because I was more relaxed I could read the ocean better. It’s like reading the play for a goalie. If you are relaxed you become more aware of your surroundings. One doesn’t get tunnel vision in a relaxed state. I didn’t fight the current; I used it to my advantage. When a big set was about to crash on my head, instead of tensing up, I stayed relaxed and stroked firmly and consistently. I found that not only did I move faster, but also I had more time than I realized to get under the wave before it broke. And when I duck-dived I had more power to push down and get under the waves. Similar parallels can be drawn in goaltending. A player skates down the wing and winds up for a clapper from the top of the circle. It is instinctive for most to tense up and prepare for the confrontation. As the forward prepares to shoot, the goalie can be thinking, “I have to stop this. If I don’t I’ll let the team down and blow my opportunity to be a starter. I don’t want to get beat low. I better get down and cover as much net as possible…” The goalie internalizes everything and cannot react freely to the situation. Usually he ends up dropping early and gets into a blocking mode just hoping that the puck hits him. 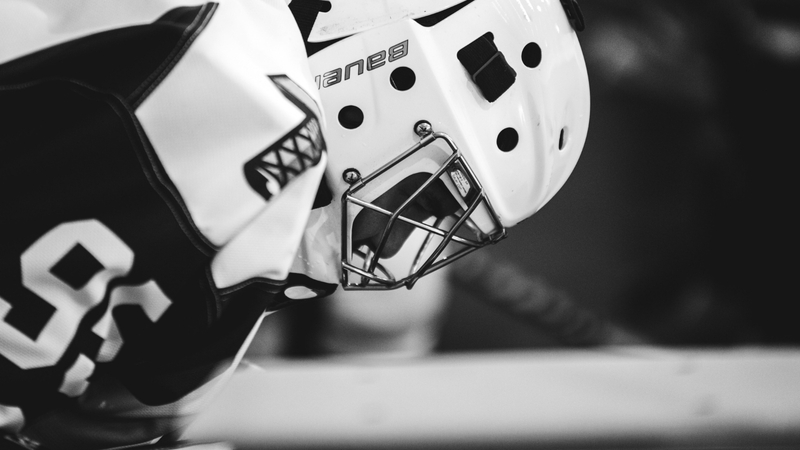 A better approach is to breath, relax the shoulders, empty the mind and just watch the puck. It is amazing how much time one has to react to a shot when you are relaxed. …The puck is in the slot on the opponents tape. The goalie gets low, tenses his muscles and gets ready to be explosive on the shot. No! Wrong approach. Stay big in your stance, breathe, and relax the muscles, wait and react. You have more time than you think and will react quicker to the release if you stay big and relaxed. As well, when a goalie stays big and calm, even if he doesn’t move, the player, because he is rushed, will often hit the goalie or shoot wide. Not only does the game slow down when one breathes steady and is relaxed, but energy is also conserved. You will be less tired during penalty kills. At the end of games you won’t be as drained. You will enjoy the experience and have fun rather than just trying to get through it. It seems counter-intuitive to relax and breathe when a situation calls for urgency. But that is exactly why they say not to panic in an emergency. When one panics, his breathing shortens, his muscles tense and he stops thinking clearly. He ends up running around aimlessly and wasting valuable energy instead of focusing on the task. The only way to survive in an emergency is to stay calm. Breathe, relax the jaw, relax the shoulders, and relax the mind. React to the ocean. Stay calm and deal with whatever it stirs up.